You need to move quickly as a desperate seller, but that doesn’t mean you should forgo some basic research about home selling alternatives. Don’t fall for instant offer programs or other vulture investor schemes, don’t just give your listing to the building broker and don’t call your friend to be your listing agent. Lastly, try to avoid contingent offers and make sure you get started as soon as possible! The absolute worst thing you can do as a desperate seller in NYC is to sell to an instant offer program. These are the companies that have advertisements with titles such as “We Buy Houses,” promising to give you an all cash offer on demand and close within a certain number of days. Don’t be fooled, this expediency comes at a great cost. All cash offers from this iBuyer or instant offer programs are typically 60% or less of your home’s potential market value. It’s no wonder then that these vulture investors are advertising so loudly that they’ll buy your property! Don’t get drawn in by the excuses of some of these vulture investors or even well-funded start-ups. Some of them will outright claim that they are doing everyone a service because they are helping you more seamlessly move to a new home. Sure, that can be convenient, but at what price? How much of a discount or how much of a fee do you have to give them? PRO TIP: Remember that the only way to sell your property for its full market price is to actually put it on the market. That means having it be listed by a traditional broker with a good reputation on your local MLS (RLS for NYC customers) and all relevant public real estate websites. 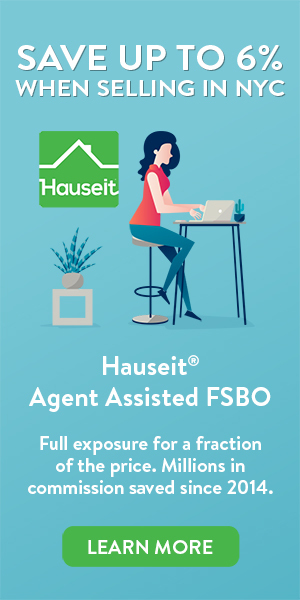 These days, you can do so for a flat fee through our Agent Assisted FSBO listing service, or for only 1% in listing commission through an Agent Managed Listing. While not as bad as just caving in and selling to a vulture investor program, it’s almost as irresponsible and lazy to just sign an Exclusive Right to Sell Listing Agreement with the broker who lives in your building. Why not spend literally 10 minutes on the web researching some good alternatives before signing up with your neighbor (who by the way makes a livelihood preying on everyone in your building)? Sometimes deferring the easiest and laziest choice by literally a few minutes can save you tens or even hundreds of thousands of dollars in commission. And don’t you think it’s a bit presumptuous that the “building broker” will just assume that they have your listing, before you’ve even fully decided if you wish to sell? Why does this neighbor of yours think they have the right to collect 6% in commission from you? Just because they happen to live in the building? Don’t fall for the scam of thinking that the broker who lives in your building will have so much more insight or ability to sell your apartment just because he or she is a building resident. It doesn’t take a Ph.D. for any competent listing broker to quickly get up to speed on your building and neighborhood. PRO TIP: What is the cheapest way to sell a house? While we recommend that you prudently do your research on alternatives to paying 6% in broker commission, please be careful about many of the cheapest paths which either give you incomplete marketing exposure or list you in the wrong MLS. Don’t cop out and pick up the phone to call your acquaintance or friend or has a real estate license. While that may seem like an easy thing to do, this path more often than not leads to poor outcomes and broken friendships. Remember first of all that there are 50,000 licensed real estate agents in NYC, and only 5,000 or so closed sale transactions per year. That means your average agent has not or never will do a deal. Do you really want a novice agent to handle what may be the biggest transaction in your life? Just being your friend should not be a consideration when it comes to choosing how to list your property. Carefully do your research online and figure out the listing service that works best for you. For example, do you have time to show your own home? If so, you can actually save all 6% in broker commission through an Agent Assisted FSBO listing. Or, do you want someone to do everything for you? You can still get Full Service for 1% through one of our experienced partner brokers. No matter what, don’t pick up the phone and agree to list with your friend just because it’s the first number that comes to mind. Take a few minutes and do your research. Not only will you potentially save tens or even hundreds of thousands of dollars in commission, you may also be saving a friendship. PRO TIP: Are you seriously considering selling your home by yourself, or through a pocket listing? Before you decide to take your home off-market, read our tips for selling a house privately. No matter what, don’t procrastinate. Start researching options and alternatives for selling your home as soon as you find out that you’ll need to move or sell. The more time and heads up you give yourself, the more negotiating leverage you’ll have, whether it’s with your future listing agent when negotiating a commission, or with potential buyers when they submit a lowball offer. PRO TIP: Read our guide for how to find motivated sellers so you’ll know what not to do. 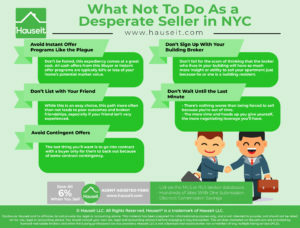 The last thing you’ll want to do is to show these classic signs of being desperate sellers. Ideally, buyers and their agents should have no idea that you are desperate to sell! 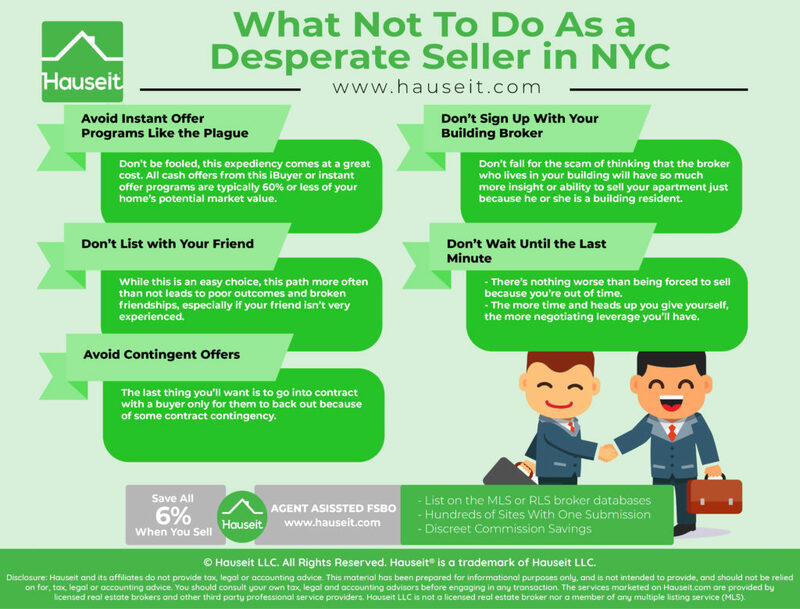 Don’t waste time with unqualified buyers, or buyers with too many contingences if you’re a desperate seller in NYC. The last thing you’ll want is to go into contract with a buyer only for them to back out because of some contract contingency. In practice, the only really “standard” contract contingency you’ll see is the financing contingency, which may include language for a mortgage contingency, an appraisal contingency and a minimum loan amount contingency. Waiving the mortgage contingency clause in NYC is unlikely for most buyers who will be financing their purchase, so you’ll likely have to stomach this contingency when reviewing and accepting offers. However, you can mitigate your risk by carefully screening offers and reviewing buyers’ REBNY Financial Statements to make sure they’re financially qualified. This is especially important if you are selling a co-op apartment as you’ll need to make sure the buyer will also meet co-op debt to income ratio requirements as well. 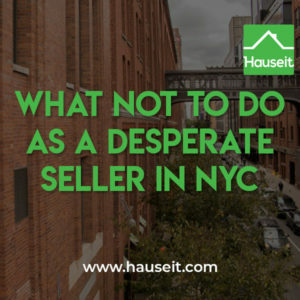 PRO TIP: Are you a desperate seller in NYC because you are selling and buying a house at the same time? This is one of the trickiest maneuvers to pull off, but you can make the process easier by working with one of our experienced partner brokers who know all about the Hubbard Contingency as well as the post-closing possession agreement.